On August 14th, 2018 at 11.36 a.m. the so called “Morandi bridge”, one of the main highway bridges of the North Italian town Genoa collapsed, killing more than 40 people. 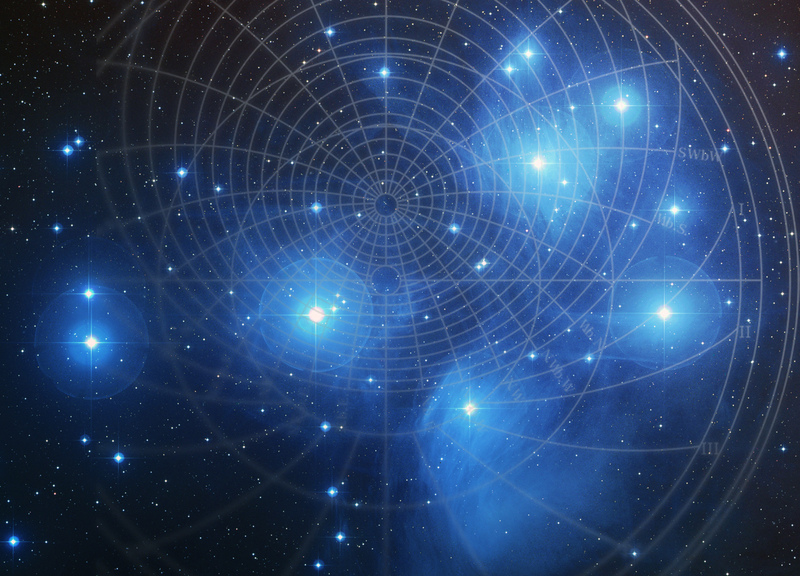 In this article I will analyse how this terrible event shows up in the inauguration chart (which I will be using as a radix) the annual perfection, the solar return, the circumabulation through the bounds and finally in the transits. The goal of this paper is not that of pretending to be able of forecasting similar events, but simply to learn and test timing techniques which can then be applied in, hopefully, far less dramatical consultations for the benefit of the client . My thoughts, however, are with the victims and their families. The bridge has been inaugurated on September 4th, 1967 at 6. pm. 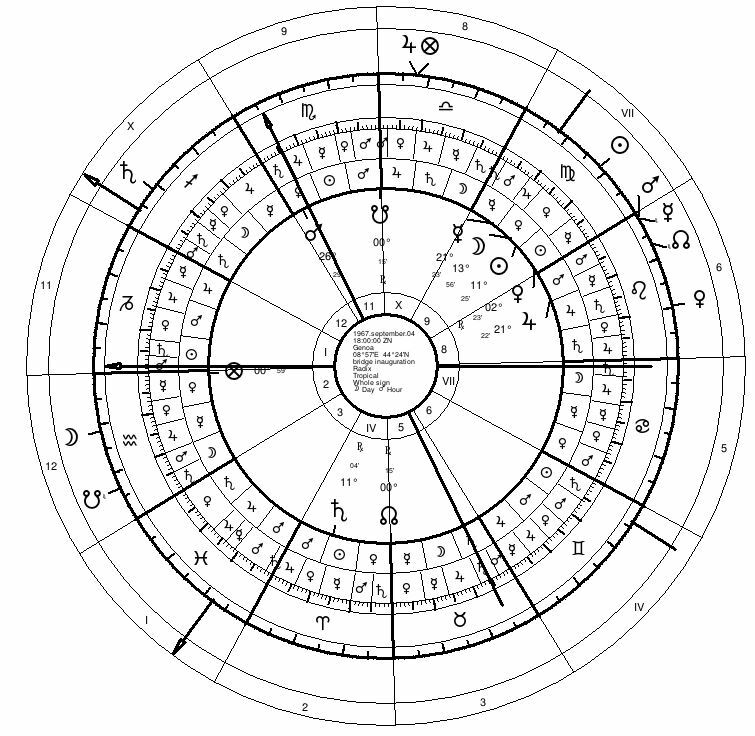 The inner wheel shows the moment of the official inauguration, the outer wheel shows the antiscia positions of the planets. Capricorn is rising in the last degrees. Its ruler Saturn is strongly afflicted by being peregrine, retrograde and in the sign of his fall. Saturn is in the 4th house which is associated with the earth, the pavement, the lowest point. Not really a good position for a huge bridge. The 4th is also referred to as “grave”. Saturn is the only planet below the horizon and he is not in orb with any other planet. Furthermore, he squares the AC (his own domicile) by sign and thus does not support it. 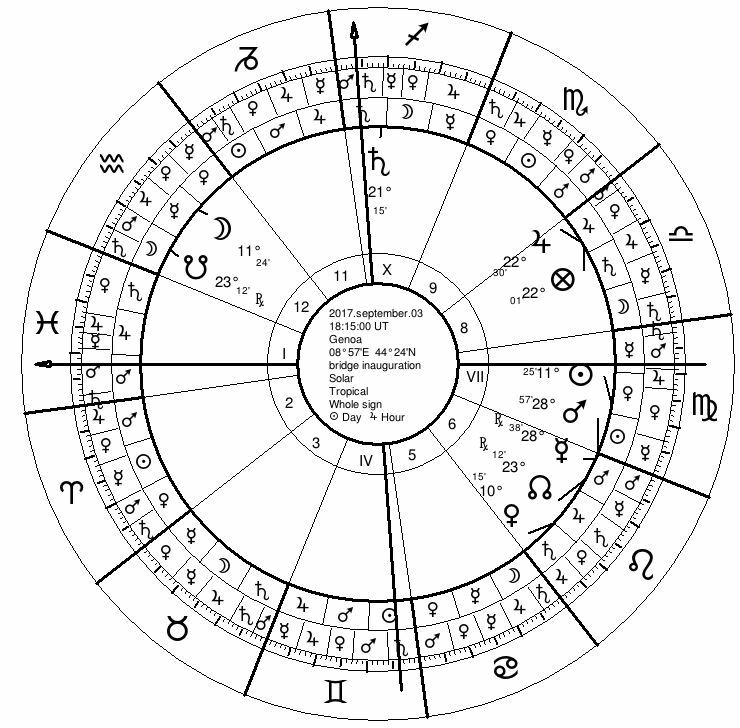 The destroyer Mars is conjunct the MC and sextiles the AC, which he rules by exaltation. His antiscion is in the 1st house. Saturn (11°04’) is within 3° of orb with the antiscion of Mercury (8°36°), while the antiscion of Saturn 18°55’ Virgo is also within 3° with the radical Mercury (21°23’). The Moon, ruler of the 6th house of “illness” (in this case better to be addressed as damages) translates from Sun, the ruler of the 8th house (death) to Mercury (travellers, tourists, foreigners). The negativity of this chart is impressive. Let us now have a look at the annual profection of this year. In August 2018, the Morandi bridge was 50 years old  and thus the 3rd house, which rules transport and roads, was activated (see red dot). The lord of the year is Jupiter, who is in the bounds of Saturn in the radical 8th house. These very negative indications are further highlighted by the circumambulation through the bounds: The profected Ascendant of the inauguration chart is in the bounds of Mars at the moment of the crash. With this information in mind, we will now check the bridge’s solar return for 2018. Pisces is rising, and thus the 1st house , which describes “life” in a human, or in a bridge its duration or stability, is ruled by Jupiter, who is already Lord of the year. The principal themes for 2018 are thus stability/duration, traffic and roads. 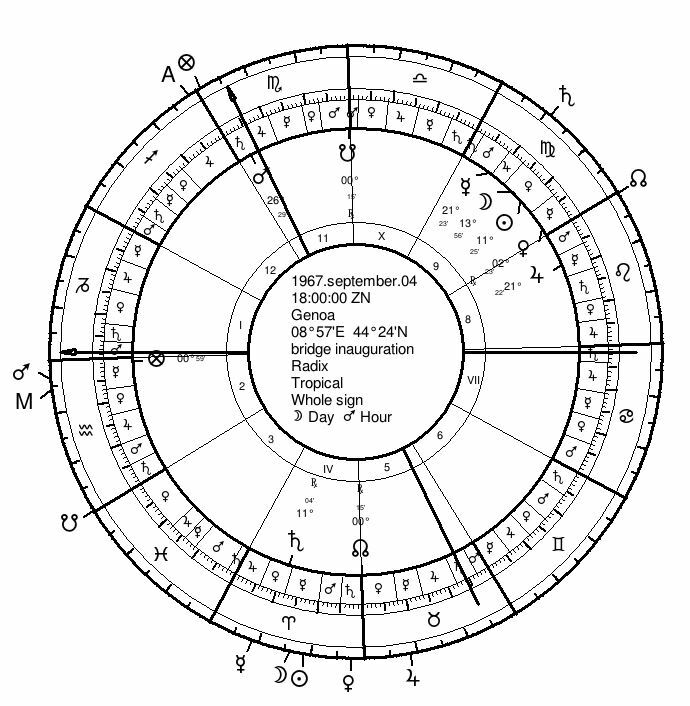 Jupiter is in the 8th house (death) of the Solar Return chart (SR), conjunct Fortune, which also relates to the body. Jupiter is afflicted by Saturn, the malefic out of sect, elevated precisely on the Midheaven and in the bounds of Mars. Saturn describes dysfunctions, lacks, leads, fractures and generally “weight”, which menace the body of the bridge. Now let’s put the charts together. The inner wheel is the radix, the outer wheel the solar return. 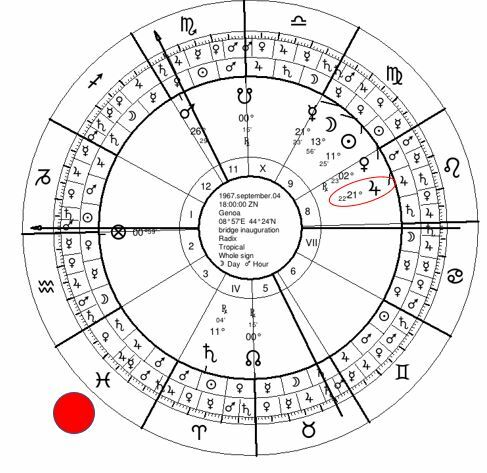 The bound ruler Mars is in the 8th radical house aspects the radix Mars, the malefic out of sect. 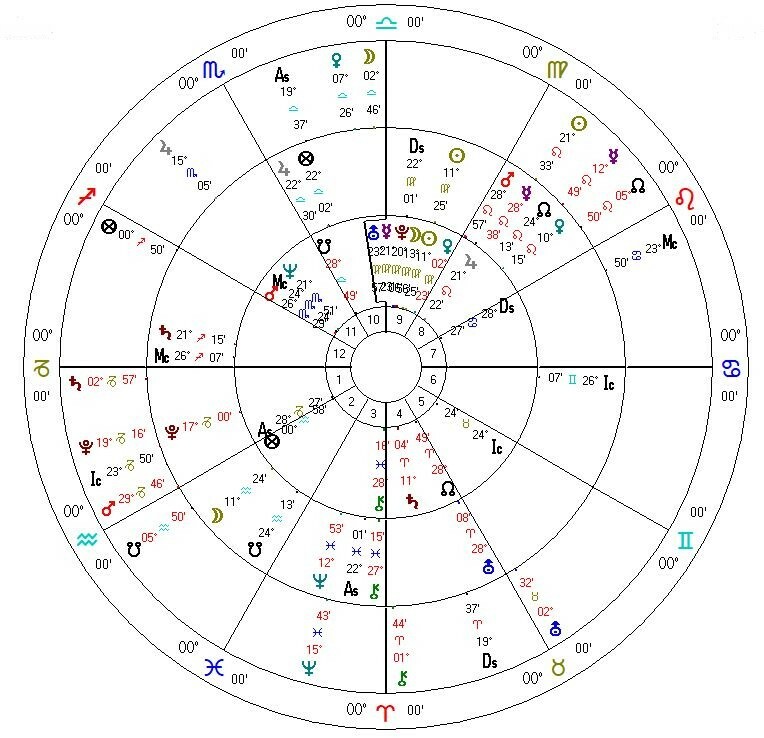 SR Saturn is in the 12th house of destruction/despair and is exactly being trined by the Lord of the year Jupiter and -with a small orb- by SR (and bound ruler) Mars. Transiting Moon is in the 8th house of the annual profection and translates from (transiting) destroyer Mars to Venus, the ruler of the 8th in the annual profection. The Transiting Lord of the year (Jupiter) is exactly conjunct Zuben Elgenubi and thus just in the area of the famous chelae, when, in ancient times, Scorpius was much bigger than now and included that part which we know today as Libra. William Lilly mentions these chelae as particularly malefic. It is interesting to note that the bridge possibly collapsed because the iron cables in the pillars were erosed and literally “cut”, as in a pair of scissors. Chart drawn with Morinus free Software. If we want to consider quandrant houses, we see that Saturn rules the 2nd house, which describes substance, and in particular the material by which the bridge is built. As we can see, this material is in a very poor shape. Saturn usually describes heavy material, weight, masses. But here he is retrograde, possibly lacking something. He is in Aries, a fire sign, which describes metals and iron. One of the hypotheses of the collapse experts are working on, is the quality (and quantity) of the iron in the bridge and its possible erosion. 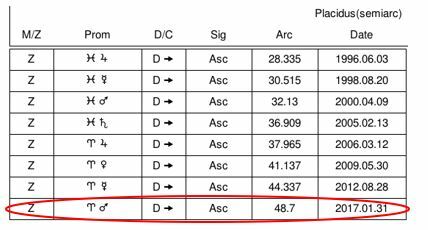 William Lilly only considers antiscia if they are in exact aspect (by degree), but in this particular case, both planets, Saturn and Mercury are in conjunction with each other’s antiscia if we consider an orb of max. 3°. The bridge would have been 51 on September 4th. The profected Ascendent switches into the next bound of Saturn only on December 8th, 2019. If we take Pisces as the Ascendant for this year, Jupiter, being in Scorpio, is in the 8th from the profected Ascendant. Hello Tania, which software do you use to calculate the first graphics with antiscia positions and bounds. Thank you.